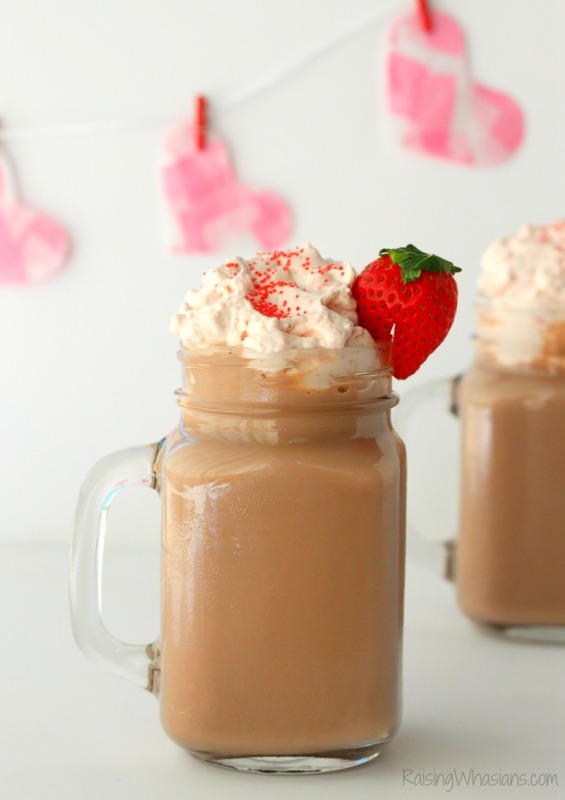 Enjoy a perfect date night in with this Easy Strawberry Whipped Cream + Valentine’s Day Hot Cocoa Recipe. This Valentine’s Day inspired post is sponsored by TruMoo. All delicious opinions are my own. The adorable dress. The heels. The make up. No, thank you. Valentine’s Day is in the air, and while lots of moms are getting gussied up for the big day, I’m thinking pajamas, cuddling and the perfect Valentine’s Date Night In. Loving on my husband doesn’t mean we have to get fancy, especially with two little ones at home. 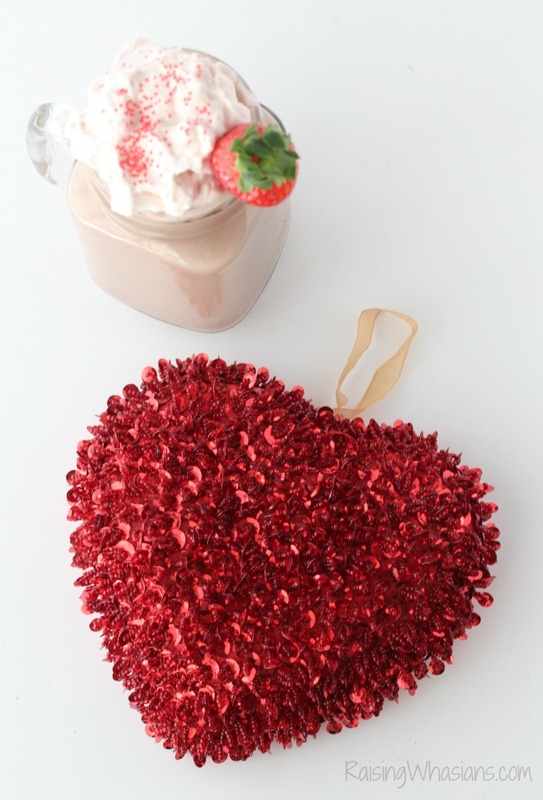 Enjoying a sweet date night in is just what we need, and this Easy Strawberry Whipped Cream and Valentine’s Day Hot Cocoa is the crowning touching to our plans. I can definitely say this is the busiest time of our lives. Between work schedules, school schedules, after school activities and a busy toddler, it can be overwhelming to even plan a date these days. Getting the stars, moon and our calendars to align perfectly…not so easy. So how are we keeping the spark alive? Date nights at home. A movie, a late night snack and us together is our idea of the perfect date as our kids snooze the night away. A man’s love is through his tummy, and with my husband it’s no exception. This guy LOVES food, especially when it’s made with love. And with another cold front hitting Florida, it’s blankets and hot cocoa for the win. But I can certainly find a way to jazz up hot cocoa for my husband’s belly, right? So this easy homemade Strawberry Whipped Cream provides the perfect touch of “I love you” for our Valentine’s date night. 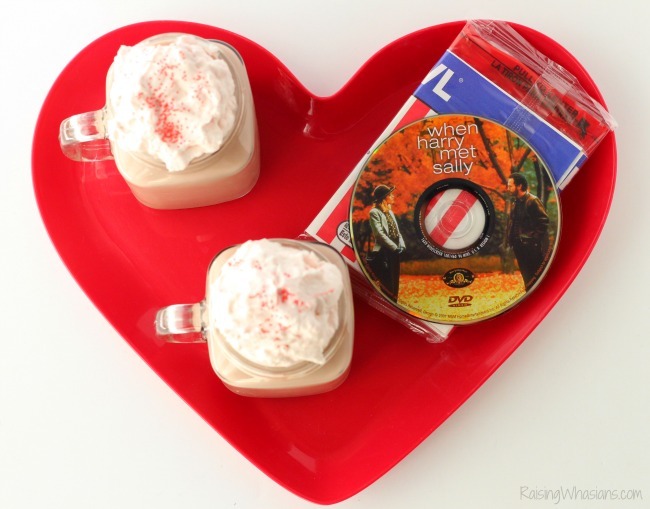 Made quickly with a little Valentine’s Day inspiration, and we have a hot cocoa recipe that sweetens the mood so we can dive right into our night together. Ready to whip up a batch of your own Strawberry Whipped Cream (yes, that pun was intended)? Here’s your recipe for love! In medium mixing bowl, beat heavy whipping cream and sugar until stiff peaks form. Beat in strawberries until well combined. Pour TruMoo Chocolate Marshmallow Milk into 2 mugs. Microwave 45 seconds - 1 minute, or until hot. Top hot cocoa with a dollop of strawberry whipped cream. Perfect right from the fridge, and tastes even better served hot! The movie is picked. The popcorn is popped. And the delicious taste of homemade hot cocoa seals the deal for a cozy night in bed. 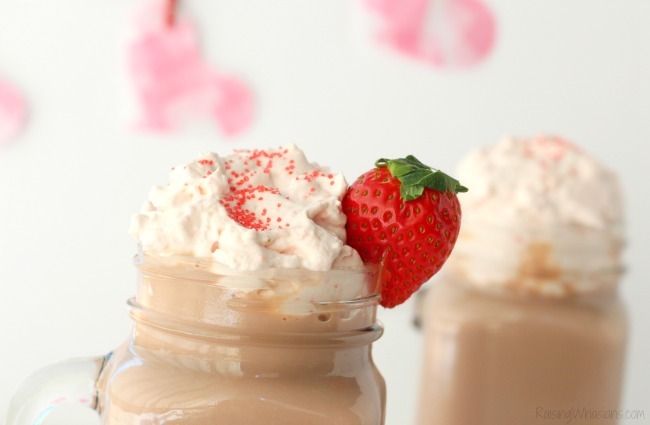 Life is sweet with this Easy Strawberry Whipped Cream and Valentine’s Day Hot Cocoa. My husband and I are ready for the perfect Valentine’s Date at home, while our babies sleep the night away. 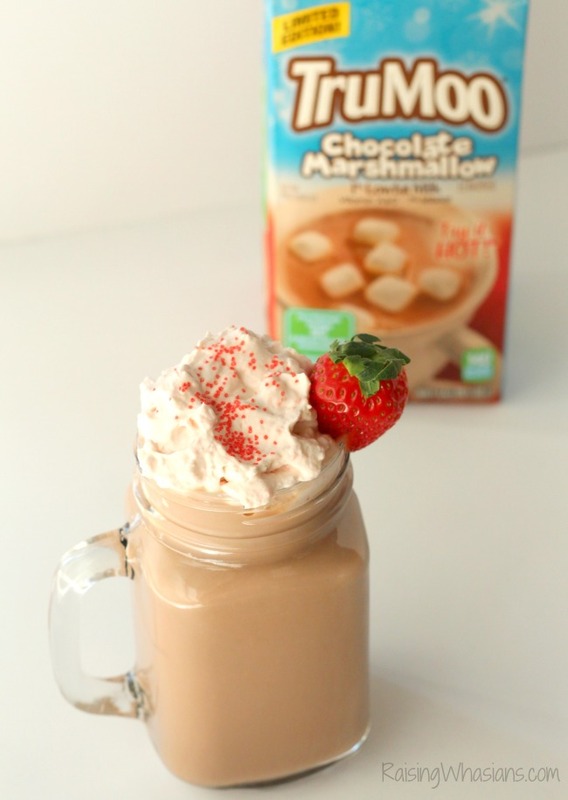 Looking for more delicious TruMoo inspired recipes? 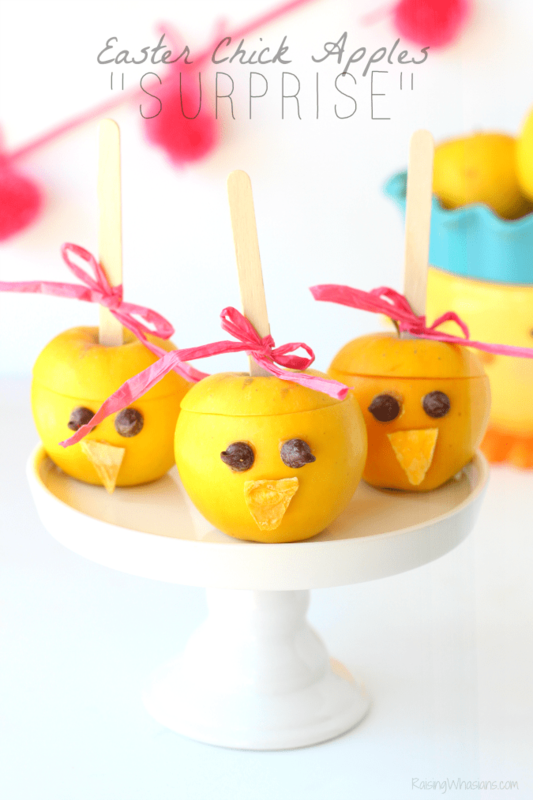 Check out these Pudding Cups & Popsicles! How would you enjoy the Limited Edition TruMoo Chocolate Marshmallow this winter? Be sure to follow Raising Whasians via Facebook, Twitter, Google, Instagram, Pinterest and YouTube for more easy recipes, kid crafts, family travel & adventures in mommy-hood! That sounds so delicious. I can’t wait to try it! I love hot chocolate. It’s a perfect treat for Valentines Day, especially when you make it fancy like this. 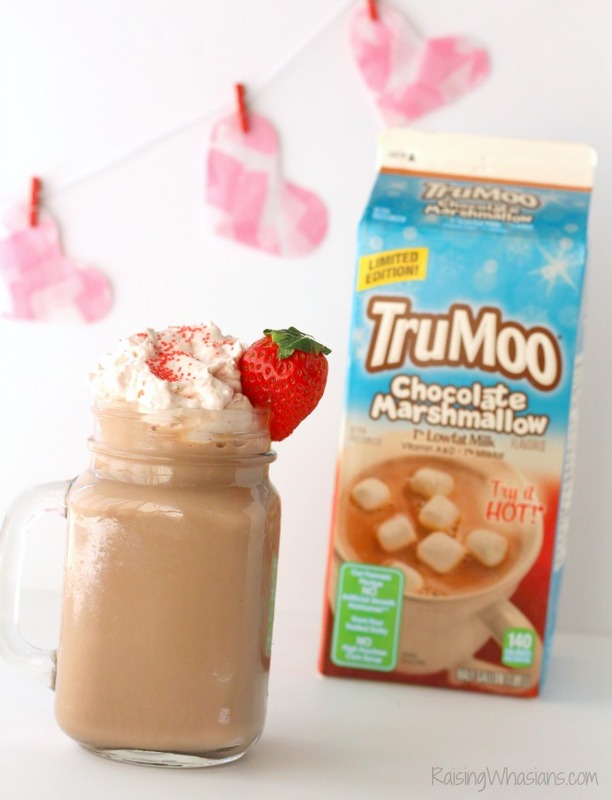 What an easy recipe idea and I like TruMoo so must give it a taste test to make this with the kiddos! That looks so yummy! Especially when it’s cold out I love to come home to a nice cup of hot cocoa! 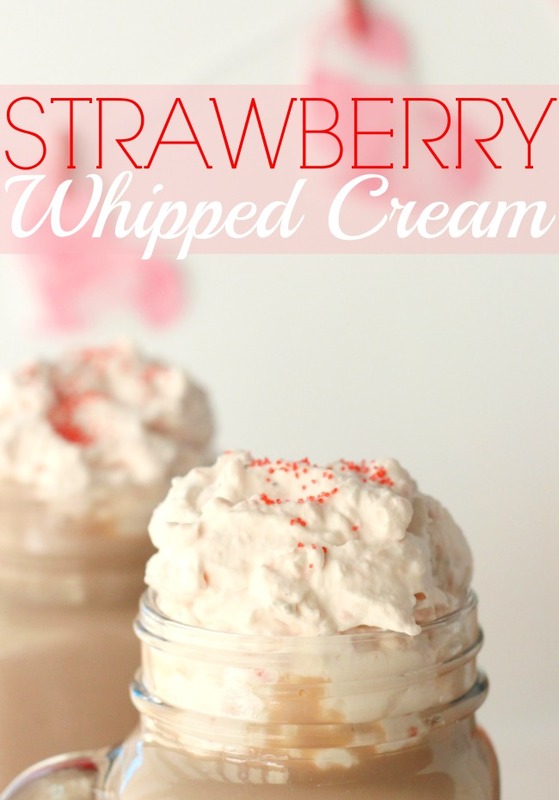 Strawberry whipped cream sounds fantastic! It’s two great tastes that taste great together. This sounds so good. I’d be happy to make some for my family on Valentine’s Day. We love Troo Moo around here. That Strawberry topping looks perfect. This looks so delicious and easy to make. I will have to try this recipe on the weekend. We drink TruMoo all the time, but mostly just the chocolate flavored milk. Those are great beverages for this time of year. 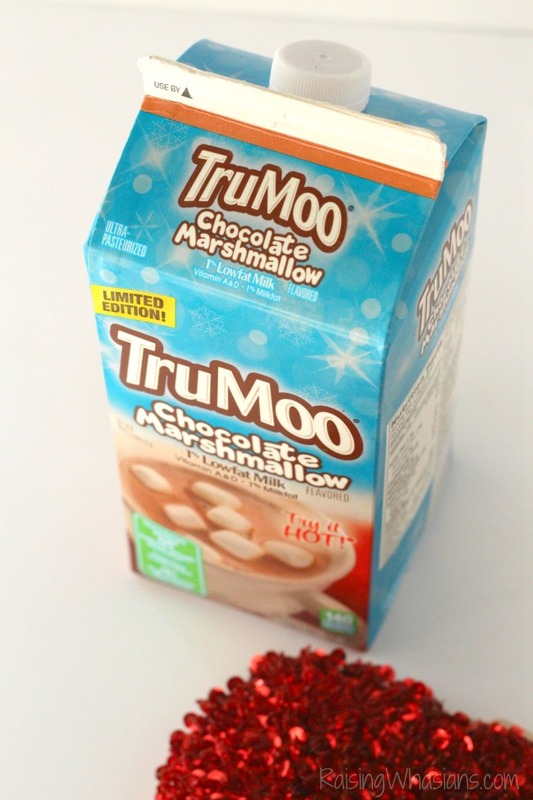 I didn’t know hat they had a TruMoo with marshmallows in it – even yummier!! Plus right now there is a TruMoo contest: 2 WAYS TO VACAY SWEEPSTAKES. Codes are on the lids. This sounds like such a tasty drink! It is so simple too – must give it a try. I love that you used fresh strawberries! What a delicious treat for Valentine’s Day. Sounds like a great treat during this Florida cold snap…that seems to be much longer than usual. I think my hubby will love it…the kids too. We both love hot chocolate especially after a walk in cold weather. I can’t wait to try this!!! This sounds absolutely delicious. We are going to have a hot chocolate party at school on Friday. We should incorporate these ideas! This sounds amazing! I will be making this treat for Valentine’s Day. Looks like a wonderful Valentines treat! I have never had hot chocolate with strawberry whipped cream,it does look good and worth me trying. This looks delish! We often make our own whipped topping, but I have never thought of flavoring it with anything other than vanilla. It’s really divine! I hope you get a chance to try it!